Philippe Gilbert (Decenunick-Quick Step) is one of the senior statesmen of the peloton, and one of the more victorious. He has a stated goal of winning all of the Monuments before he retires. Until today, the Hell of the North had eluded him. 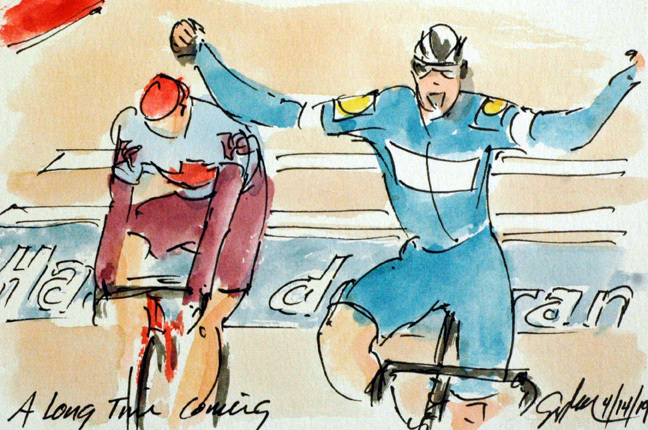 So it was with great joy that he spread his arms in victory on the legendary velodrome of Roubaix. Nils Politt (Katusha-Alpecin) had to content himself with a hard fought second place. The trio finished at least thirty seconds ahead of Gilbert's teammate, Yves Lampaert. Gilbert's bold attack with 15 kilometers to race was the moment of victory since it was only Politt who could match the acceleration of the former World Champion. Chapeau, Gilbert! I plan to paint on or two more of the Spring Classics ahead of the Tour of California and the Tour de France. Sep Vanmarcke (EF Education First) had been following every move until an ill timed mechanical took his hopes of winning away. Vanmarcke called for his team car once the Mavic neutral service vehicle realized they could be of no help. Vanmarcke was joined in the chase by Peter Sagan (Bora-Hansgrohe) and Yves Lampaert (Decenunick-Quick Step) tried in vain to chase down the two leaders up the road. It appears that Sagan, was not going to be able to repeat his victory from 2018. Apparently only one rider has ever managed to win back to back Paris Roubaixs, and that was Tom Boonen. On the final five star pave section it was Philippe Gilbert (Decenunick-Quick Step) and Peter Sagan (Bora-Hansgrohe) rubbing shoulders while trying to establish themselves on the front of the race. 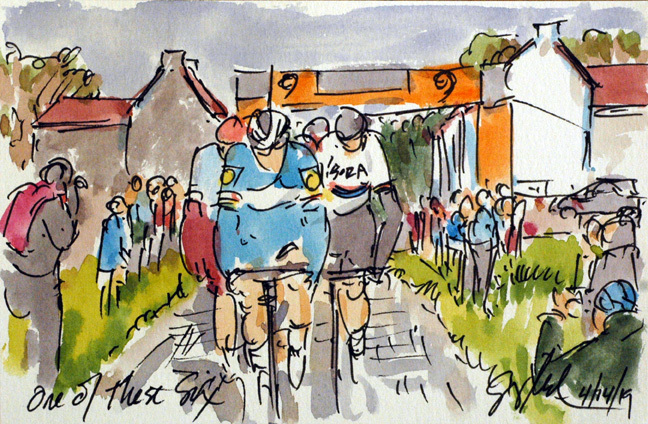 While it looked like a head-butting sprint, it was just two guys on the rivot bouncing their way to Roubaix. 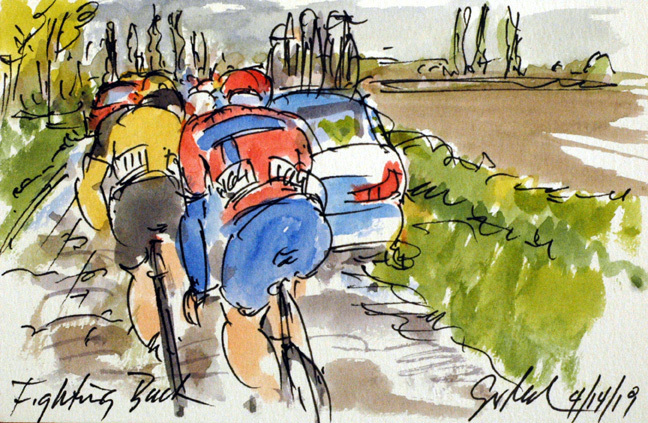 Behind, it was Nils Politt (Katusha-Alpecin) with Yves Lampaert (Decenunick-Quick Step) slipping backward. The crowds were huge, yet managed to not impose themselves into the race. Those racing had enough to deal with, without drunken and/or oblivious fans further endangering the competitors. As the leaders entered Pave Section 9, it was beginning to look like these six would be the ones who would vie for the win on the velodrome of Roubaix. It was Philippe Gilbert (Decenunick-Quick Step) who lead Peter Sagan (Bora-Hansgrohe), Nils Politt (Katusha-Alpecin), with his teammate Yves Lampaert, Sep Vanmarcke (EF-Education First) and Wout van Aert (Jumbo-Visma). Behind the peloton was trying to chase, but did not seem able to close the one minute gap. For those of you who read this blog regularly, you will know that I love a good pun. This title examplifies that perfectly. After catching Wesley Kreder (Wanty-Gobert), this trio of Philippe Gilbert (Decenunick-Quick Step), Nils Politt (Katusha-Alpecin) and Rudiger Selig (Bora-Hansgrohe) decided it was their turn to go on the attack. 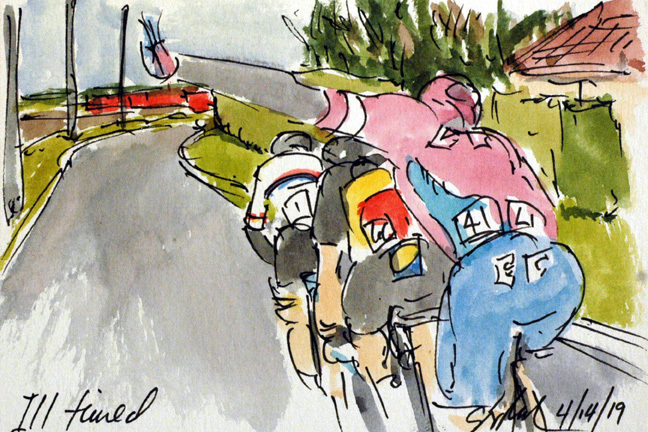 With Gilbert in the group (a former World Champion) the peloton was going to pay attention to this move. Selig was there to monitor the move for his team leader (and defending champion of Paris Roubaix), Peter Sagan. 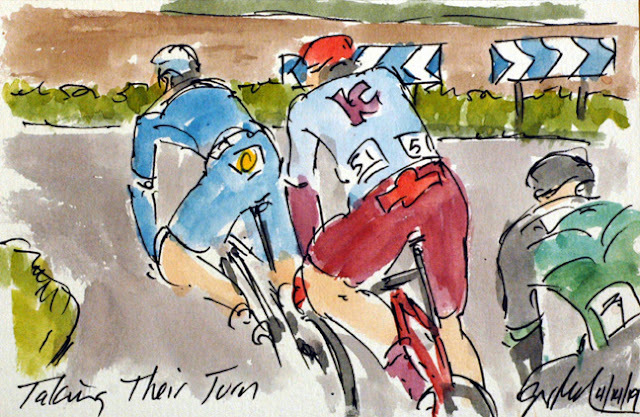 Perhaps figuring he didn't have much of a chance of winning the race in the peloton, Wesley Kreder (Wanty-Gobert) took off on his own with 68 kilometers to go. Clearly, it was going to be a long solo effort, but he could be hoping that a few more opportunists would bridge across to him. Nevertheless, nothing ventured, nothing gained. Wout Van Aert (Jumbo-Visma) wasn't having the best luck on the way to Roubaix. He had a problem on the cobbles in the Forest of Ardenne where he took a teammates bike to chase back to the peloton. After getting his back up bike from the team car after catching the peloton, he crashed on a corner. He had to chase back again, but succeed in the effort. Shockingly, he was able to be a factor in the final kilometers in the race until the multiple chases finally sapped his strength. Heinrich Haussler (Bahrain-Merida) was twice able to use the motivated Van Aert to draft his way back into the peloton. Paris Roubaix is foundly (or with dread) as the "Hell of the North." 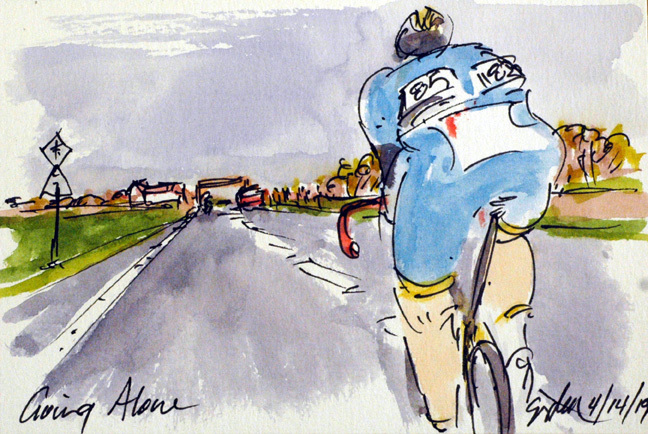 For Joseph Areruya (Delko Marseille France) it was becoming a hellish ride indeed. Arervya is the first cyclist for Rwanda to ever start this iconic race. The twitter site for Rwanda cycling alerted me that he would be racing, and I was actually able to find him during the broadcast. I, he, and all of Rwanda cycling had hoped it would be because he was off the front in a break, but at least his race wasn't completely anonymous. Both an expression of all out effort, and sound advice when racing on cobblestones. 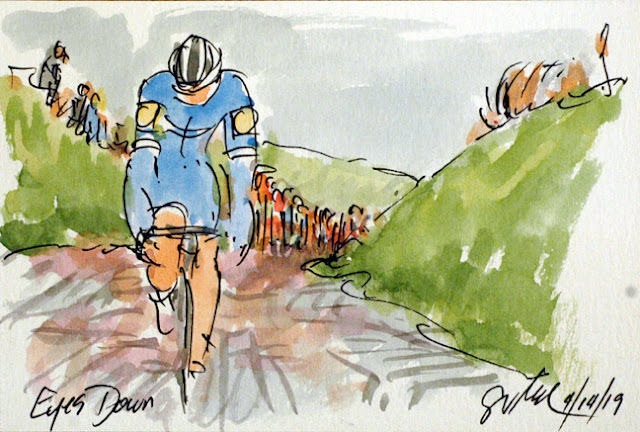 Tim Declercq (Decenunick Quick Step) was tasked with setting the pace for his teammates in the peloton. 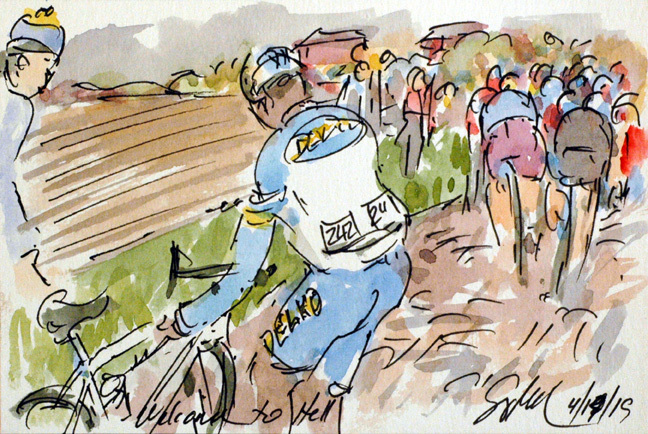 Declercq was setting such a pace that he rode eveyone off of his wheel. Decenunick Quick Step clearly had a plan for the day, and the team had the legs to put that plan into play. I look forward to this, my most favorite of the Monuments, Paris Roubaix. 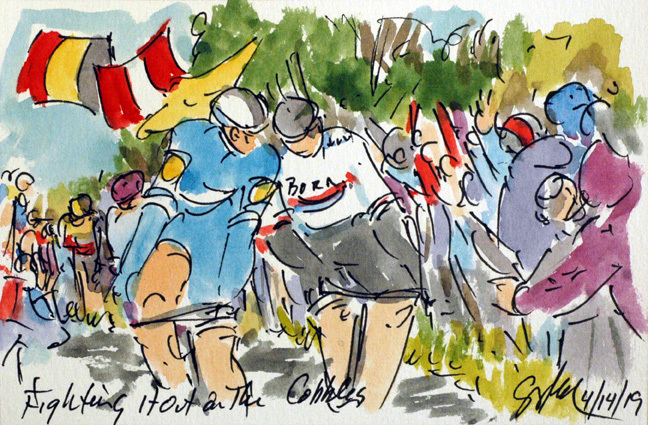 I picked up the race as the leaders, the "tete de la course" entered the 24th section of "pave." 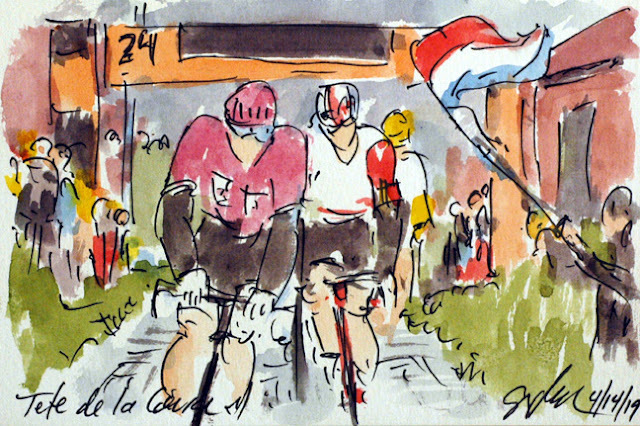 The large break, almost the leading peloton, was taken onto the cobbles by Matti Breschel (EF Education First). The cobbled sections of the race are numbered in descending order starting with #29 with the final section being comparably as smooth as glass just before the velodrome in Roubaix.